Chandni is a 1989 Indian Hindi language romantic drama film, starring Sridevi as the title character alongside Rishi Kapoor and Vinod Khanna as male leads. 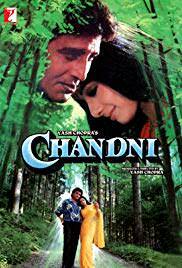 It was directed by Yash Chopra in a screenplay by Kamna Chandra, Arun Kaul, Sagar Sarhadi and Umesh Kalbagh.Chandni was a great success in 1989 and is considered one of the most successful films of all time. The profits of this musical brought an end to Chopra’s lean phase. The platinum success of its music was also instrumental in bringing music back into Hindi films.